We just bought our first house. Our first house ever. We were really good about everything. We had a Home Inspection, and discovered some issues. Many of the issues were known about- a damaged masonry stoop on the guest entrance, settling sidewalk, a fence that has seen better days. Our building inspector did advise us to get some professionals in- one was for a Chimney Service, and the other for a sewer line inspection. I spent a day of my Spring Break hanging out around the house that we were (potentially, at this point) trying to buy. 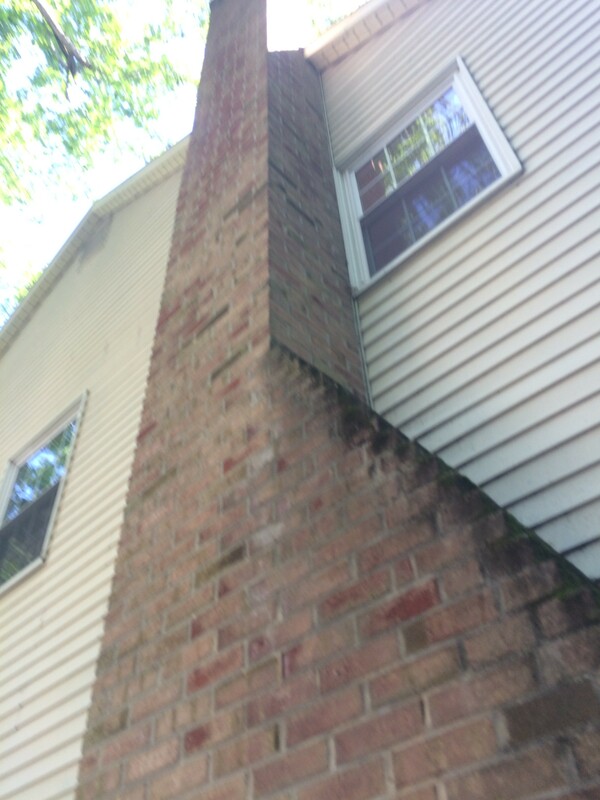 My first appointment was with Mason’s Chimney Service of Mickleton, NJ. These guys were knowledgeable, came highly recommended from both our Realtor and through online reviews. They discovered that the mortar in-between our flue tiles was missing, presumably due to water infiltration. 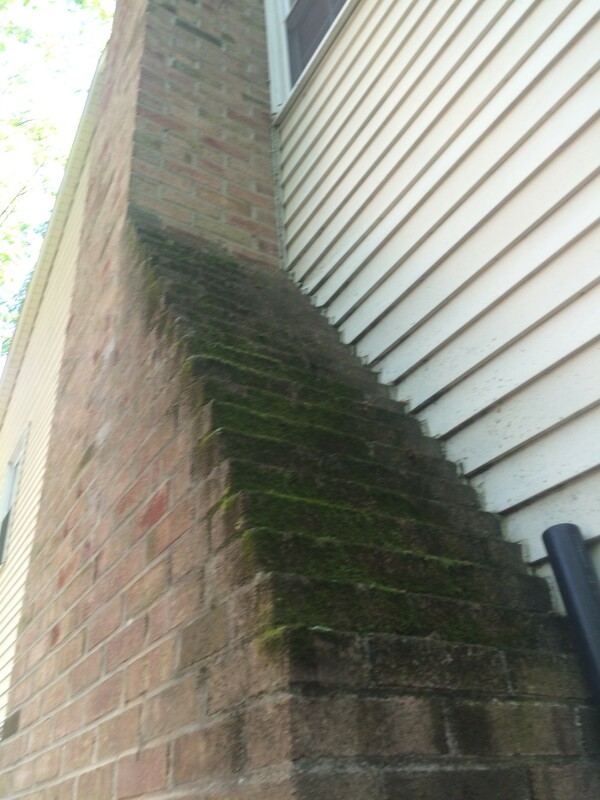 There was a ton of moss on the outside of the chimney- again, screaming of wet brick. I know this stuff- I teach it. Moss is one of the pioneer species, and is great at breaking down rock. Where it’s terrible is on housing materials, presumably because you don’t want your house to fall apart. Now, here’s where things get a little dicey. Our seller, wanted to shop around for chimney services, according to her realtor and communicated to our realtor. I don’t see a problem with this- having more data is better. There were 2 other quotes, one from Smith’s Chimney Service for $3800 (pretty close to the Mason’s Chimney Service quote), and one way off- $2175 from Ridgway Chimney Service. I passed along these fears to our realtor, who relayed the message on our behalf to her realtor. Now here’s something I was raised- You want to get the best quality for the lowest price. You want something to hold up, as opposed to having to do repeated repairs. (In the spirit of Father’s Day- Thanks Dad, I miss you). Also, let this be a lesson to everybody- ALWAYS GO WITH THE MIDDLE QUOTE! 1. What was the method they would use for sealing the Chimney? He answered they would spray it on. 2. What size liner would they use? He answered he didn’t have his notes in front of him, but it would be correctly sized for our fireplace. 3. Would all of this be “by-the-book?” He said yes, they would obtain all documentation (which I took to mean permits) as necessary. We said fine- we had assumed (because, again, we’re not chimney professionals) that the liner had been installed. I didn’t even think to call the township and ask about the permit. So we come back after the weekend, and the moss has been scraped off, but it’s still not shiny brick. I thought waterseal leaves a bit of a gloss on there. Okay, we think. And then it rains for the next week, and the drywall near the chimney starts to get more and more wet. The drywall starts to crumble right before our eyes. We call our realtor, and Ridgway sends people out. They monkey around on our roof, but (come to find out) don’t end up fixing any of the problems (that we’ll learn later). The cross-sectional area of the fireplace opening size is 980.00 square inches. The actual dimension is 35.00 inches wide x 28.00 inches high. The stainless steel flue liner is undersized. This application allows dangerous gases to enter into the living area. This is considered a potential health hazard. I recommend correction of this condition prior to operation of this fireplace. 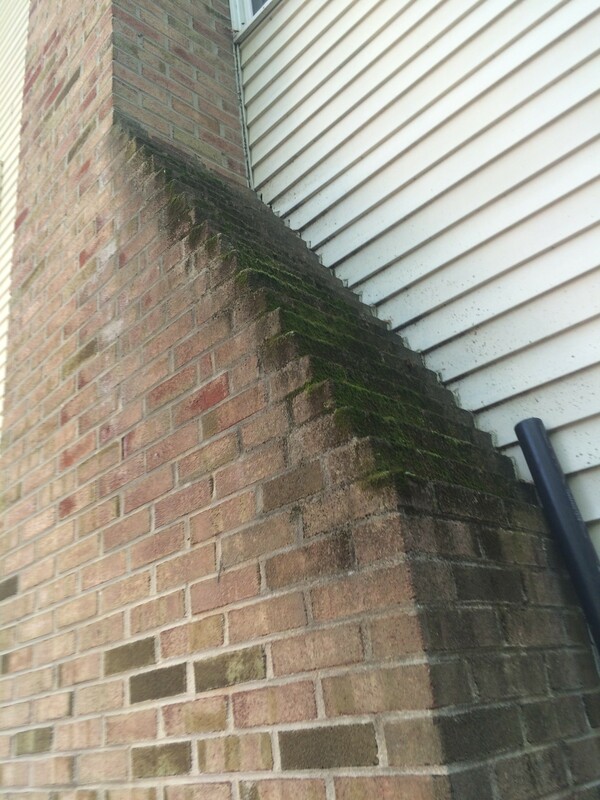 There are indications of moisture entry at the exterior of the fireplace and chimney. Dark stains are an indication of moisture entry. 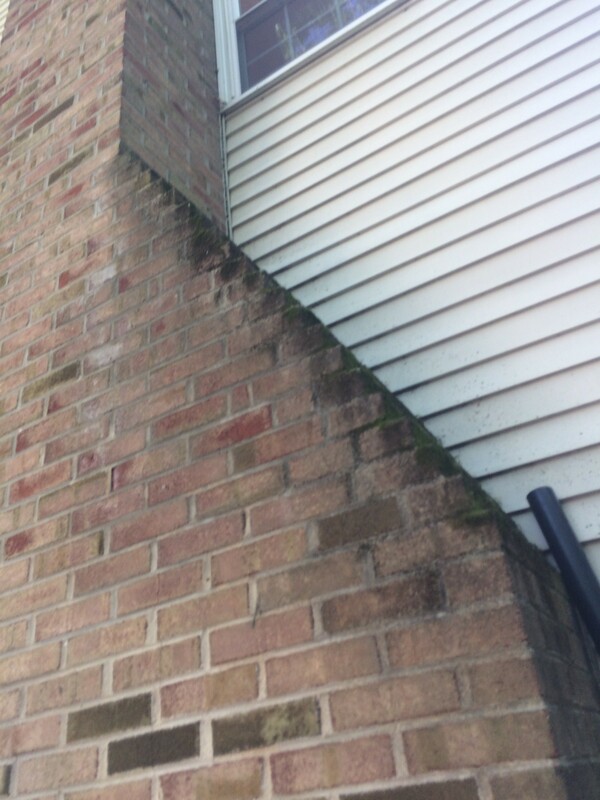 Moisture entry is know to cause premature failure of masonry materials, elevated odors from water mixing with soot and creosote, and poor draft. I recommend resolving these moisture entry concerns. The required insulation around this stainless steel liner was omitted. The liner manufacturer states that all chimney liners used for woodburning applications shall be insulated with either 1″ of poured chimney insulation or 1/2″ of foil faced wrapped chimney insulation. This omission may allow heat transfer by means of conduction and/or convection This transfer is considered a potential fire hazard. We know that there is no insulation because the base is open for viewing and there is no room for the insulation because the old damaged flue liners were not removed first. There is an inadequate seal between the stainless steel liner and the smoke chamber. The liner manufacturer requires a tight seal at this location to prevent the passage of heated gas. This application must be performed in an approved manner as per the listing. Ideally, a smooth transition from the smoke chamber to the stainless steel chimney liner should have been created using a high temperature insulating mortar. The current condition is considered a potential hazard. Based on the finding of this visual investigation and the opinion of this inspector, this fireplace and chimney were found in need of repair as listed within this report. I recommend repairs to this system prior to operation for safety. The findings listed within this report are based on the condition of the fireplace and chimney system at the time of this inspection, and may be limited due to access or type/level of inspection requested. The stainless steel liner should be removed and a video inspection should be performed of the chimney interior. The homeowner described finding “chucks” of terra-cotta flue liner inside the fireplace. We must find out where these flue liners chunks originated. Don’t go for the lowest price- it’ll most likely (when we take our seller to court) end up costing a HUGE amount of money. Don’t trust Reatlor’s Recomendations-Nicole Zampitella Gosseaux of Berkshire Hathaway HomeServices Fox & Roach Realtors (Haddonfield, NJ) expressed trust in Alan Ridgway. He ended up being deceitful. Lawyers are expensive. We tried sending a demand letter directly to cut out the middlemen, but it appears the seller is unwilling to listen to us. What a disappointing part of purchasing our first home. I would explore their relationship with Nicole – the Realtor. Of course, I don’t trust anyone.